Singer reveals just how much her tunes can teach her. Tracy Chapman is an eloquent musician, but as an interviewee, she prefers to let her songs do the talking. If only they could. When VH1 spoke to the singer, Chapman was suffering from a cold she picked up while doing promotion in Europe. So instead of the honeyed timbre we’re familiar with from “Fast Car” and “Give Me One Reason,” she sounded as if a sizable frog had taken up residency in her larynx. Don’t worry, though. Chapman’s voice is in great form on her new album Let It Rain, which may be the starkest disc of her career. Amid the hushed instruments, Tracy’s lyrics are forwarded in a truly intimate tone. “In the Dark” finds her sounding terrified in the face of desire, while “You’re the One” and “Sing Hallelujah” reach for the joy in both love and death. The melodic sensibility that’s been Chapman’s signature from the start shines through the entire disc. Chapman spoke to VH1 about unraveling the enigma of the songwriting process, explained how her older sister initially inspired her, and revealed why she should be wary of fire. VH1: You’re famously reticent. Does the promotional routine interest you at all? 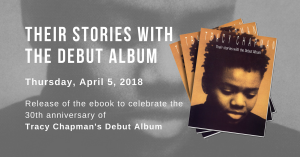 Tracy Chapman: I would have liked to have had a little break after I made the record before I started this part of it, but it’s best for me to get right into [the promotion]. It’s funny, I learn all these things about the record talking about it after it’s finished. Chapman: Well, everyone is looking for connections between the songs. I don’t usually approach a record as a concept. There’s no over-riding theme that I’m consciously trying to represent. It’s all about the individual songs. But now I see that there are some recurring themes: some things that feel threaded together, some symbolic references, and songs about some of the big questions, like death. There are a lot of references to the weather, too! Those things came through in a lot of songs, but it wasn’t something that I was conscious of when I wrote them. VH1: The first single “You’re the One” is a love song. Chapman: That’s sort of a crazy love song! Love’s a recurring theme through my work and yeah, it’s there on this record, too. VH1: Is it because love has recently entered your life? Chapman: No. It’s always been there. On Tracy Chapman there were songs like “Baby Can I Hold You” and “For You.” The songs are not necessarily autobiographical. A lot of songs are a combination of influences. It might be some part of my life, or something I’ve felt, or something somebody’s told me. It all comes together and a composite is created – a character that has a relation to me, but is not necessarily me. VH1: Is there a song on this album where, when you finished writing it, you realized it was ultimately about you? Chapman: No. I haven’t had that experience. When I’m talking about it after it’s finished, sometimes I can trace a path that goes back to the possible source of inspiration. But I’m never sure I can trust that sort of hindsight. I haven’t really found myself where I didn’t expect to! Chapman: Who knows? Songwriting is a very mysterious process. It feels like creating something from nothing. It’s something I don’t feel like I really control. I’m never sure if: 1) I’ll ever write another song, 2) what the song will be about and 3) if what initially sparked the beginning of a song might complete it. Some things remain fragments, just the lyrics and melodies or a line or two or a verse. I often write either really early in the morning, just when I’m waking up, or really late at night. “You’re the One” was a song that came to me in the morning. I woke up on my birthday, March 30, and wrote that song. VH1: So you’re an Aries. Has anyone ever drawn up your horoscope? Chapman: A fan actually saw me on the street last night. I can’t remember exactly what he said to me, but he asked me what my sign was. Then he said, “Watch the fire.” It was so cryptic! I don’t know what that means! I guess there won’t be any pyrotechnics on the tour! Chapman: It’s a song about the media and advertising and the role that they play in our lives. People’s real hopes and dreams can be distorted and misdirected and packaged until you’re not sure what you really want or what you even really need. We have more media than ever and more technology in our lives. It’s supposed to help us communicate, but it also has the opposite effect of isolating us. It was an awareness of all those things that brought that song about. VH1: I’m surprised that you wrote so much personal material when there are all these things going on in the world. Chapman: That goes back to the question about songwriting and not knowing what the next song will be about or where it will come from. I end up writing about all kinds of things. It’s a combination of influences that inspire the song. I never make an attempt to write about anything in particular. I don’t have a little list of topics to write about. Chapman: My older sister encouraged me from early on and bought me one of the first guitars that I had. She listened to all of the crappy songs that I wrote when I was eight years old and encouraged me to keep doing it. By “doing it,” I mean just being a musician and writing songs, not necessarily being a recording artist or a performing artist. She was a major influence and a major support. VH1: You play now with a band, but would you ever go back to performing solo with just your guitar? Chapman: That’s something I’ve considered doing and I’ll probably do. But I really love playing music with other people. It’s more fun to be on the road with others. It’s kind of lonely out there when you play on your own! When you feel like you’ve had a good show, you go backstage and you talk to yourself about it, and if you have a bad show you talk to yourself about it. The other thing great about being out with other people is you’re always swapping music. Somebody is always listening to something that you know you’ve never heard. It’s a great way to hear all sorts of new things.